The Information Session: Services for Small Business Owners in Eastern Humboldt held Wed. 19th September at 6pm at the Willow Creek Community Services District drew a small crowd but everyone felt it was a worthwhile meeting. Thanks to the Willow Creek Community Services District for use of their meeting room and to Willow Creek Pizza Factory for delicious pizza. Leila Roberts, Director of the North Coast Small Business Development Center gave a brief presentation on the services available to new and existing business owners. While most workshops are held on the coast, we are hopeful that we can bring some sessions to Willow Creek next year. But that will depend on the demand. 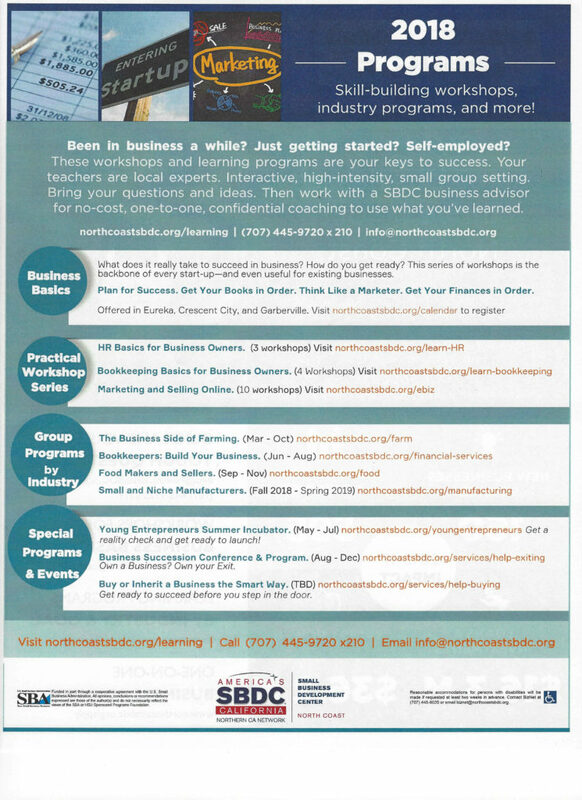 North Coast Small Business Development Center provides workshops like business basics, bookkeeping, marketing etc. Whether you are self-employed, in business for a while or just getting started, there is no-cost one-to-one, confidential coaching available. You don’t have to share your business idea and still take advantage of their resources. 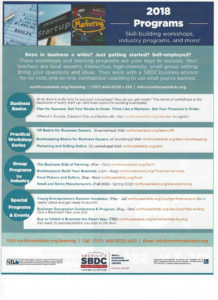 Upcoming workshops on the coast. Even with all the information available to us today, there is no substitute for talking to a consultant who has seen how a small business owner with a business similar to yours has been successful. There are workshops specific to niche industries like food production or manufacturing. The workshops listed in the flyer can be held in Willow Creek if enough people express interest in having them here. Email info@willowcreekchamber.com if you would like to participate.